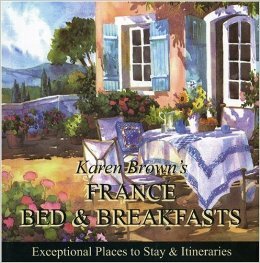 Le Lavandin has been included in the 2007-2010 editions of Karen Brown’s France B&B guide books. 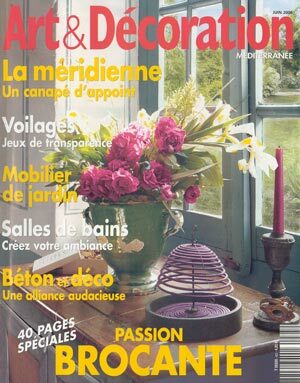 Le Lavandin is the fruit of one woman’s passion for Provence and the French savoir-vivre. Georgia, an American, has created a space that is a breathtaking combination of traditional Provencal architecture and contemporary French design and furnishings. In doing so, she offers her guests a piece of heaven. She loves flowers, books, music and cooking. You will be captivated by her garden: a lavender field, a rose garden with over 250 bushes, a flower cutting garden, a potager and an olive grove with a beautiful labyrinth in its’ midst. There are also four little sitting areas in the gardens in which to relax plus a petanque (bocce ball) court. On the property are the main house, home to your host, and a separate guest house to insure privacy and independence. The guests’ house enjoys an outside “summer kitchen;” a contemporary living-room with a library that faces the terrace with soft, colorful cushioned furniture, and four beautiful bedrooms each with its own bath and terrace. All rooms have terracotta floors, handmade doors, contemporary décor and a library. If you prefer a larger space, ask for the studio with kitchenette—a large room with miniature sofas and a big library. This place will capture your heart. Tim Lapage from Safari Experts in Park City, Utah talks with Leslie Miller about her trip to Provence, France. Tim interviews Georgia Perrin Ball at Le Lavandin. Leaving a successful Utah real estate career to open a bed-and-breakfast in southern France might seem out of the ordinary. But Georgia Ball, who moved to Salt Lake City in the 1960s and was a founding partner in the Ramsey Group in 1984, is no ordinary woman. Consider the facts: Ball did not speak French, had to supervise construction of a four-bedroom guesthouse, had only stayed in one bed-and-breakfast in her life and moved to France during one of the worst periods of U.S.-Franco relations in history. There was reason to think Ball might have been a bit wacky. Ball’s primary motivation to move to France was the fact that her daughter and two young grandchildren lived in Grenoble. She began trying to purchase property in October of 2001 and moved in January of 2003. She had not planned to build a completely new guesthouse, but when the old one collapsed on Feb. 9, she needed to construct a replacement quickly. That fact was complicated by her lack of French, though she managed to learn enough construction language to communicate with the workers who, at one point, numbered 20. The guesthouse includes a salon, living room and four spacious bedrooms, each with a terrace and private bath. It is connected to the original studio, which can sleep two adults and two small children. The facility also includes a summer kitchen that is located outside, allowing visitors to barbecue or keep their drinks in a small refrigerator. The Provence area includes hundreds of vineyards, fields filled with colorful sunflowers, aromatic lavender farms and farmland that produces most of France’s vegetables. The bed-and-breakfast is located near a pine forest and an olive tree grove. Farmers markets are located everywhere, including scenic Avignon, which is the closest city to Ball’s inn. The former Utahn also had no problem getting along with her French neighbors, even at the height of America’s anti-French attitude at the start of the war in Iraq. “I was all over the area buying things with my fractured French that made it obvious I was an American,” she said. “I did not have one hint of animosity. It was quite the opposite. People bent over backward to be of assistance. About 90 percent of Ball’s first-year guests came from Utah, a figure that has dropped to 70 percent so far this year. Louis Borgenicht was one of those, and he came away impressed. But Borgenicht, one of Ball’s many Utah friends, was not surprised that she pulled off the move. Ball is taking advantage of her Utah connections to use her inn for a variety of workshops this year. Chef Jane Otto will present “Cooking in Provence” Aug. 8-14. Eric DeBonis, another Utah chef, will present “A Gastronomic Tour of the South of France” Sept. 12-18. Painter Connie Borup is presenting “Painting in Provence” May 30 to June 5. And Utah writers David Kranes and Jeff Metcalf will teach creative writing from June 13-19 and from June 20-26 this year. Ball loves her new home. This is a story about before and after: how a successful Salt Lake City realtor picked up her roots and moved to Provence to be near her daughter and grandchildren and in the process opened a bed-and-breakfast in the town of Pernes-les-Fontaines in near record time.